Carnegie Mellon University President Subra Suresh celebrated his first official university visit to India Friday, July 3 by signing an agreement that will support outstanding students from India who want to pursue doctorates in math, science, and engineering at CMU. The new partnership with India's Science and Engineering Research Board (SERB) kicked off a weekend of events in which Suresh and other university leaders met with alumni, future students, and industry and government leaders, in a nation with significant ties to the university. The centerpiece of the visit was the July 4 event, "Integrated Intelligence," in which hundreds of university affiliates and guests heard international leaders address such critical topics as smart cities and big data. The event culminated with a gala dinner featuring talks by Suresh; Raj Reddy, the Moza Bint Nasser University Professor of Computer Science and Robotics; and Lalitesh Katragadda (CS 1996, 1998), former country head of India Products for Google, as well as a vocal performance by Joshua Grosso (A 2016), a musical theater major. The event was the largest of its kind CMU has hosted outside the U.S. The agreement signed by CMU and SERB will provide $2.4 million in fellowships over the next five years. The fellowships will support a minimum of five Indian students each academic year, beginning in the fall of 2016. CMU will encourage all admitted doctoral students from India to apply for a SERB fellowship. 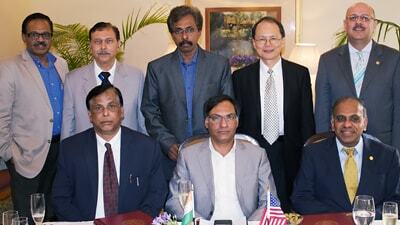 The agreement extends the university's long history of collaboration with India. The country hosts the largest concentration of CMU alumni outside of the U.S., nearly 1,800. 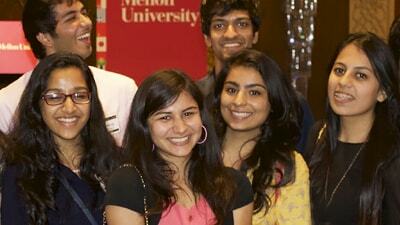 More than 1,300 students from India attended CMU last year, representing one of the university's largest international student contingents. President Suresh, who was born and raised in Chennai and educated at IIT, said the fellowships will benefit all parties, and carry a personal significance for him. "We look forward to working with the Board to develop the next great generation of scholars, scientists and engineers who will help address many of the 21st Century human challenges," President Suresh said. President Suresh signed the agreement with SERB Secretary Tavarekere K. Chandrashekar. SERB was established in 2008 through an act of Parliament by India's Department of Science & Technology. SERB's mission is to promote basic research in science and engineering, and to provide financial assistance to people, academic institutions, laboratories, industrial concerns and other agencies engaged in research. "SERB is delighted to partner with CMU on doctoral fellowship program, and through this program, talented Indian scholars will be able to pursue research in frontier areas which are of relevance to India. I am sure this partnership will gain strength in the years to come," Chandrashekar said. Partnership was also a theme at the Integrated Intelligence event, where a large crowd of alumni, incoming students, and other friends of the university gathered to hear academic and industry leaders address topics very much in the news in India in recent weeks — smart cities, and digital infrastructure. "How do we marry human intelligence with artificial intelligence to elevate the human condition? This is potentially the greatest transformational opportunity of our time," CMU Provost Farnam Jahanian said, introducing the panel discussions in the afternoon and kicking off the landmark event. "Who better in the world to focus on these problems than CMU?"